The high school graduation rate for Black students jumped nearly 4 percent between 2011 and 2013, narrowing the gap between Black students and white students and helping contribute to the highest high school graduation rate for American students and for Black students in the country’s history. The good news about the educational achievements of Black students was celebrated in data released yesterday by the U.S. Department of Education, which also highlighted the jump in the graduation rates for Hispanic and American Indian students. The department also said there are an additional 1.1 million Black and Hispanic students attending college since 2008. In the midst of a startling array of data demonstrating that the Black community has been sliding backwards in its economic status, this news portends good tidings for the future financial state of the Black family. If hundreds of thousands of additional Black children are attending college, there is a good possibility the economic backsliding could be halted. A devastating study by researchers for the Brookings Institution released last October showed that based on recent trends a majority of Black children born into middle-class families will drop down into a poorer income bracket as adults. The study, conducted for the Boston Federal Reserve by researchers Richard V. Reeves and Isabel V. Sawhill, also confirmed that your chances of escaping childhood poverty and moving into a higher income bracket are dramatically higher if you were born white than if you were born Black. While about 16 percent of white children born into the poorest one-fifth of U.S. families will rise to become a member of the top one-fifth by the time they turn 40 years old, just 3 percent of Black children will make it to the top, the researchers found. And even more alarmingly, of Black children born to parents in the middle income group, only 14 percent will move up into higher income brackets as adults, while 37 percent will remain in the middle class and an almost unbelievable 69 percent will move downward and be poorer than their parents. It is this income prediction that the Black students currently graduating from high school will be trying to prove wrong. 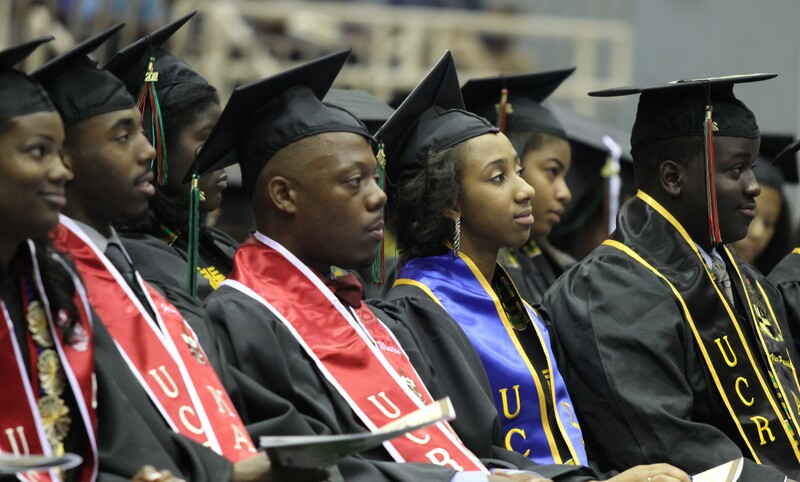 For Black students, the graduation rate rose from 67 percent in the 2010-2011 school year to 70.7 percent in the 2012-2013 school year, a jump of 3.7 percent. That compares to an increase for white students from 84 percent in 2010-2011 to 86.6 percent in 2012-13. The gap between Black students and white students closed to 15.9 percent in 2012-2013 from a gap of 17 percent in 2010-2011. The rate for Hispanic students rose from 71 percent in 2010-2011 to 75.2 percent in 2012-2013, an increase of 4.2 percent. The gap between Hispanics and whites closed from 13 percent in 2010-2011 to 11.4 percent in 2012-2013. The overall graduation rate of 81.4 percent is the highest ever recorded in the U.S. Although the Education Department didn’t try to offer the specific initiatives leading to these increases, President Obama used the historic increase in the graduation rate during a meeting yesterday with leadership from the Council of the Great City Schools as evidence that his administration’s programs are working, according to published reports. The department said it has invested more than $1 billion to help prepare students for the critical skills they will need to graduate high school and be prepared for college and successful careers. Among the initiatives the department mentioned are early education, expanded college access and affordability for families, and grant programs such as Race to the Top, Investing in Innovation, and School Improvement Grants.